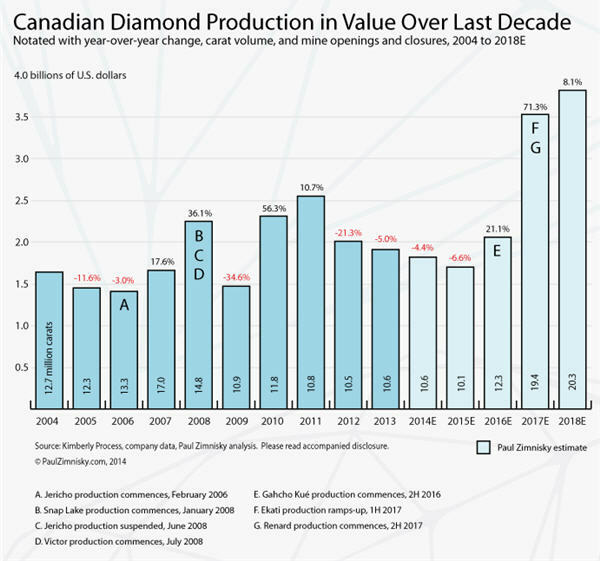 Canadian diamond production chart. Image is from Paul Zimnisky. With the development of Gahcho Kué and Renard mines underway, Canadian diamond production will be taking a big step up. Gahcho Kué project, run by Mountain Province Diamonds, is the largest new diamond mine under development globally. The Gahcho Kué Project consists of a cluster of four diamondiferous kimberlites, three of which have a probable mineral reserve of 35.4 million tonnes grading 1.57 carats per tonne for total diamond content of 55.5 million carats. Production is scheduled to start in 2016. Stornorway's Renard project is a C$946 million project in the James Bay region of north-central Québec. First ore is scheduled to be delivered to the plant in the second half of 2016 with commercial production scheduled for the 2nd quarter of 2017. Paul Zimnisky adds up the numbers.